After years of knitting socks using various techniques / patterns / types of needles, I think I've finally assembled a combination of elements into a basic pattern that I will refer to as my "Winner." 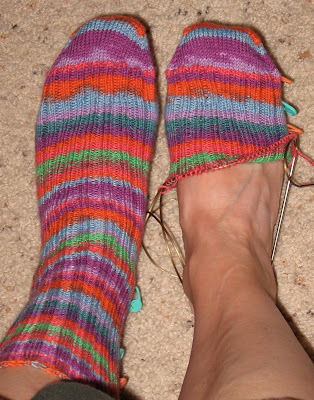 These techniques are probably familiar to most sock knitters who are experienced knitting socks from the toe up; I am just publishing this combination of techniques in this post so that I can refer to it in the future (row counts, number of stitches to cast on to fit my foot, etc), and in case it might be helpful to any of you. This is rough, and does not include every single detail, but hopefully you get the idea of my standard cobbled together sock pattern from it. Please feel free to e-mail me if you have questions regarding any additional details. Row 1: Knit one round. Row 2: *K1, M1B (by performing M1 by picking up stitch from back to front), knit to one stitch before end of first needle, M1F (by performing M1 by picking up stitch by inserting needle from front to back), K1*; repeat once. Repeat Rows 1 and 2 until there are 72 stitches total (36 stitches on each needle). Foot section pattern: Knit 36 stitches (all of the stitches on the first needle); on second needle K3, P2, *K2 P2* seven times, K3. This completes one round. Repeat "Foot section pattern" until 75 rounds have been completed, or until foot of sock is desired length minus 2.25 inches. After the heel is worked, return to working "Foot section pattern" for 14 rows. On next row, switch to standard 2x2 ribbing for the rest of the sock. Work 75 rows total of 2x2 ribbing, or until desired length has been achieved. Bind off using Russian Bind-off.